PURPOSE: Meniscoids are folds of synovial membrane that project into the articular cavities of zygapophyseal joints throughout the cervical spine. These structures have been implicated in musculoskeletal neck pain; however, their anatomy has not been extensively investigated. The purpose of this study was to explore the morphometry and composition of the cervical zygapohyseal joint meniscoids. METHODS: Twelve adult cadaveric hemi-spines were dissected and their C2-3 to C6-7 zygapophyseal joints disarticulated (six female; six left; mean 81.5 years, SD 7.3 years). Meniscoids were identified and their surface area, protrusion length and articular cartilage degeneration measured. Specimens were then sectioned sagittally, stained with haematoxylin and eosin, and examined with a light microscope. Data were analysed descriptively and using non-parametric hypothesis testing (significance p < 0.05). RESULTS: Meniscoids were identified in 86% of zygapophyseal joints examined; 50% contained both ventral and dorsal meniscoids, 7% contained a ventral meniscoid only and 29% contained a dorsal meniscoid only. Meniscoids were classified as adipose (4%), fibrous (74%), or fibroadipose (22%) based upon histological composition. There were no significant associations between meniscoid size (surface area or protrusion length) and gender, position in joint, spinal level, or articular degeneration. Increased articular degeneration was associated with fibrous meniscoid classification. CONCLUSIONS: The morphological patterns observed, such as the association of fibrous meniscoids with cartilage degeneration, may provide insight into the significance of the zygapophyseal joint meniscoids in neck pathology. Further investigation is needed to explore the morphological qualities of these structures in a pathological population. Zygapophyseal joint meniscoids are composed of fibrous tissue, adipose tissue, or a combination of the two. [9, 13] They are often crescent-shaped or semicircular, and located at the ventral and dorsal poles of a joint. [9, 17] Previous authors have described the anatomy and morphology of the cervical zygapophyseal meniscoids [6–9, 11, 13, 19]; however, these studies have, in many respects, yielded conflicting results. 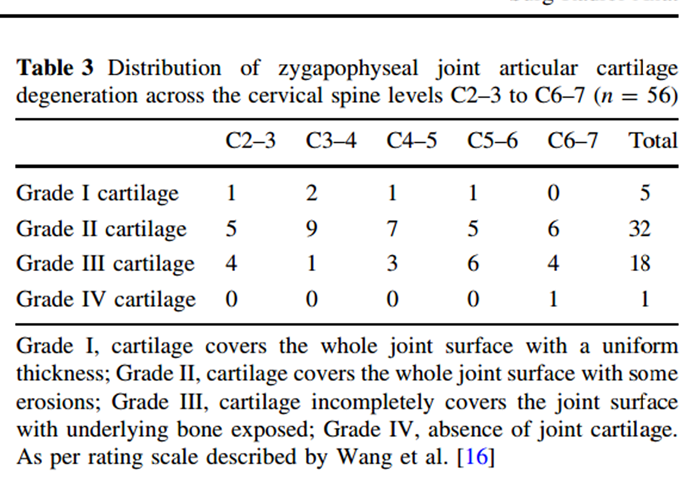 In the cervical zygapophyseal joints of adults Yu et al. reported meniscoids to be rare and Fletcher et al. reported them to be non-existent, whereas Mercer and Bogduk , Inami et al. , and Friedrich et al. have all reported meniscoids to be common. Published patterns of morphological variation have also been conflicting, with the influence of articular degeneration [7, 9, 11] and cervical spinal level [7, 13] upon meniscoid morphological characteristics being described inconsistently in previous anatomical studies. Notably, the influence of gender upon cervical zygapophyseal joint meniscoid morphology has only been examined in one imaging study  that reported gender to have no influence upon meniscoid size or composition; however, a dissection study of the lateral atlantoaxial joint meniscoids  reported cervical meniscoids to be larger in male than female specimens. In order to properly understand the anatomy of the cervical zygapophyseal joint meniscoids, normal patterns of morphological variation must be clarified. From a clinical perspective, an understanding of normal cervical meniscoid anatomy is important as these structures have been reported to possess nociceptive fibres  and may be involved in neck pathology. [2, 13, 17] Knowledge of the pathoanatomical characteristics of these structures therefore cannot be fully appreciated without a clear understanding of their anatomy in a non-pathological population. The aim of this study was to explore the morphology and morphometry of the cervical zygapophyseal joint meniscoids, including investigation of patterns of variation in meniscoid structure associated with joint position, spinal level, articular degeneration and gender. Twelve cervical spines from donors aged 69–93 years (mean 81.5 years, standard deviation 7.34, 6 female) were sourced from the tissue banks of the Department of Anatomy, Otago School of Medical Sciences, University of Otago. Cadavers were embalmed in accordance with mortuary protocol using ethanol and water-based solutions. Each donor signed an informed consent document prior to death as per the bequest protocols of the University and in accordance with the Human Tissue Act (2008) of New Zealand; ethics approval for the study was also obtained from The University of Newcastle Human Research Ethics Committee. The study was undertaken in accordance with the ethical standards set out in the Declaration of Helsinki. Specimens were included in the sample if their cervical zygapophyseal joints were intact. The muscles and overlying soft tissue were removed from each cervical spine, and each occiput was disarticulated from the atlas using a scalpel. A dental burr (Beaver Ace Dental Micro Engine, Osada Electric Co. Ltd., Tokyo, Japan) was then used to remove the posterior arch of the atlas by removing the posterolateral aspects of the bone at either side of the spinous process. Using a bone saw (KamLok Professional Model 20-A, St Louis, MO, USA), cuts were made along the longitudinal axis of the cervical spine through the laminae and the pedicles, such that the zygapophyseal joints could be removed as a single column. The left or right zygapophyseal joints of each donor were randomly selected for inclusion, such that even numbers of left and right joints made up the sample. The columns were then removed from the formic acid and rinsed in distilled water. Using a razor blade, individual zygapophyseal joints were removed by slicing obliquely through the articular pillar in the same plane as the zygapophyseal joints, such that a block of tissue was produced comprising one joint: the inferior articular process of the superior vertebra, and the superior articular process of the inferior vertebra. Each joint was stored in a single labelled specimen container. Each demineralised zygapophyseal joint was dissected using a dental burr, surgical microscope (Op-Mi 6, Carl Zeiss, Jena, West Germany), forceps and scalpel. The dental burr was used to remove the demineralised bone of the inferior articular facet of the superior vertebra, down to the level of the articular cartilage and capsular attachments, in accordance with the method described by Inami et al. and Mercer and Bogduk. Dissection of the joint was then undertaken using a surgical microscope, by carefully excising the zygapophyseal joint capsule near its attachment onto the inferior articular facet of the superior vertebra, such that the joint could be gently disarticulated by lifting away the articular surface, and the joint capsule and any meniscoids were left intact in situ on the articular surface of the superior articular facet of the inferior vertebra. Each identified meniscoid was inspected using a surgical microscope. 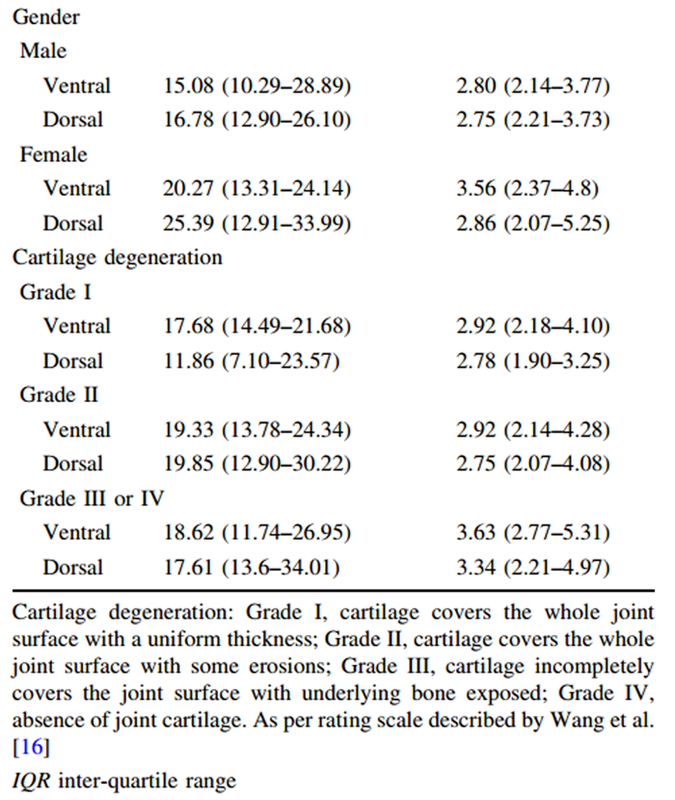 Articular cartilage was assessed using the grading system proposed by Wang et al. : Grade I cartilage covers the whole joint surface with a uniform thickness; Grade II cartilage covers the whole joint surface with some erosions; Grade III cartilage incompletely covers the joint surface with underlying bone exposed; Grade IV is an absence of joint cartilage. Sketches and notes were made regarding meniscoid appearance and location within the joint, and each joint was photographed using a Canon Powershot G10 14.7 megapixel camera (Canon Inc., Tokyo, Japan) mounted on a dissecting microscope (Olympus SZX7, Olympus Inc., Tokyo, Japan) using a Canon LADC58K conversion lens (Canon Inc., Tokyo, Japan), an Olympus DF PL 0.759 microscope lens (Olympus Inc., Tokyo Japan) and a Schott MC500 microscope light source (Schott Inc., New York City, NY, USA). The digital photographs of the joint surfaces and overlying meniscoids were measured using Adobe Photoshop (Adobe Systems Inc., San Jose, CA, USA). 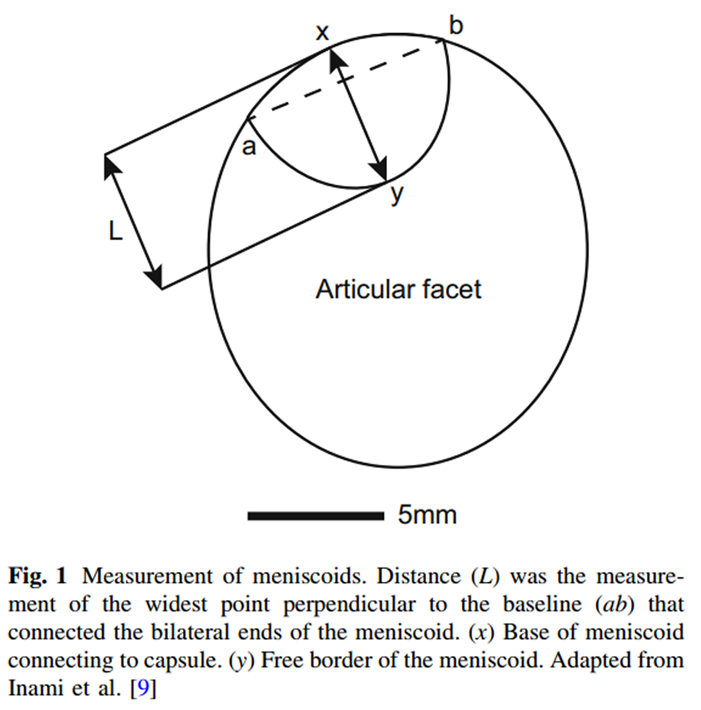 Measures undertaken included meniscoid surface area as a proportion of the surface area of the superior articular facet of the inferior vertebra, and length of meniscoid protrusion into the joint using the method described by Inami and colleagues  (Figure 1). This was achieved using Adobe Photoshop, which calculated the distances and areas in pixels, which were then converted into mm using a scale bar included in each photo. Each specimen was immersed in 70% ethanol and rinsed for 1 h. Tissue was paraffin mounted and a microtome was then used to take 5-lm sections through the midline of identified meniscoids. Sections were then fixed on slides, stained with haematoxylin and eosin, and viewed under a light microscope (Olympus CH30, Olympus Inc., Tokyo, Japan). A total of 60 zygapophyseal joints were dissected. Four were excluded from morphological examination due to damage in processing (two C2–3, one C4–5, one C6–7). Of the remaining 56 joints, 32 contained ventral meniscoids (57%) and 44 contained dorsal meniscoids (79%). Eight (14%) joints did not contain a meniscoid, 28 (50%) contained both ventral and dorsal meniscoids, four joints (7%) contained a ventral meniscoid only and 16 joints (29%) contained a dorsal meniscoid only. A total of 76 meniscoids were identified and measured; however, a technical issue during the processing of two joints (one containing a dorsal meniscoid and another containing ventral and dorsal meniscoids) meant that 73 meniscoids underwent histological examination. Each meniscoid featured a base and an apex. The base arose from the joint capsule and then extended into the joint cavity to form an apex. Three types of meniscoid were identified, based upon their histological characteristics –– adipose type, fibrous type and fibroadipose type (Table 1; Figure 2). Three (4%) meniscoids were classified as adipose type. These structures were composed primarily of adipocytes, and covered with adipose-type synovium demonstrating 1–3 layers of synoviocytes (Figure 3). They were semicircular or crescent-shaped, with a clean, well-defined free border extending into the joint cavity. Two of three adipose meniscoids were located at the ventral aspect of the joint. Blood vessels were noted within one of these meniscoids, identified as round or elongated structures of epithelial cells, often containing erythrocytes and surrounded by loose connective tissue. Fifty-four (74%) meniscoids were classified as fibrous type. These meniscoids were composed of dense irregular connective tissue and lined with fibrous type synovium, featuring a variable number of layers of synoviocytes, ranging 1–5 cells deep. These structures were elliptical, crescent-shaped, triangular or irregular in shape, and in 40 cases, demonstrated a frayed or ragged free border. Twenty-three of the fibrous meniscoids were located at the ventral aspect of the joint, and 31 were observed at the dorsal aspect. Blood vessels were noted traversing 25 of these meniscoids. Sixteen (22%) meniscoids were composed of a mixture of fibrous tissue and adipocytes, and classified as fibroadipose meniscoids. Histologically, these structures featured a blend of adipose tissue, dense irregular connective tissue and loose connective tissue, lined with fibrous type synovium featuring variable depths of synoviocytes. These meniscoids were round, crescent-shaped or semicircular, and possessed a clean, well-defined free border. Six of these meniscoids were located at the ventral aspect of their joint, and ten were located at the dorsal aspect. Blood vessels were noted traversing ten of these meniscoids. 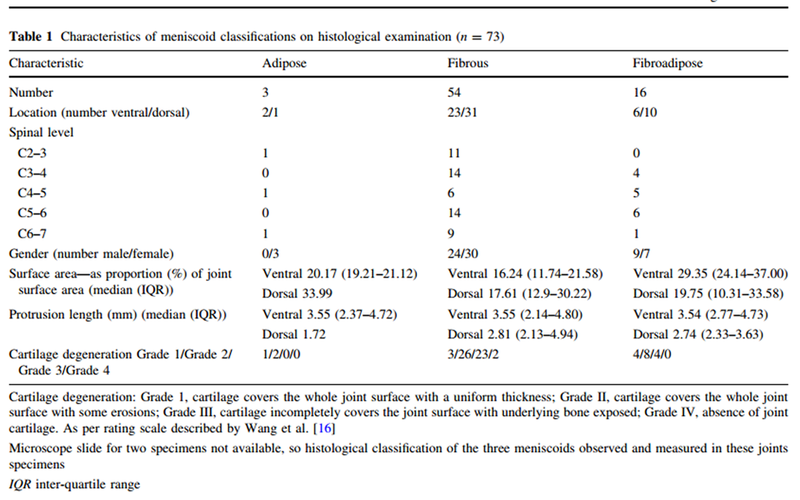 Median meniscoid surface area (calculated as a proportion of joint surface area) was 19.31% (IQR 12.87–27.1), and median meniscoid length was 2.88 mm (IQR 2.2–4.32). Median meniscoid size can be seen arranged in relation to the various study factors in Tables 1 and 2. No significant difference existed between dorsal meniscoid surface area and ventral meniscoid surface area (mean difference 2.03%; -0.35 to 7.41 95% confidence interval (CI)). No significant difference existed between dorsal meniscoid protrusion length and ventral meniscoid protrusion length (mean difference 0.06 mm; -0.70 to 0.81 95% CI). Median ventral and dorsal meniscoid surface areas and protrusion lengths for adipose, fibrous and fibroadipose meniscoids can be seen in Table 1. A significant difference was detected between the three groups for ventral (p = 0.02) meniscoid surface area; however, no significant differences existed between the groups for dorsal meniscoid surface area (p = 0.54), ventral meniscoid protrusion length (p = 0.85) or dorsal meniscoid protrusion length (p = 0.43). Median values of meniscoid surface area and protrusion length for both ventral and dorsal meniscoids at each spinal level are provided in Table 2. No significant difference existed between meniscoid surface areas across the different spinal levels for the ventral meniscoids (p = 0.56) or for the dorsal meniscoids (p = 0.32). There were also no significant differences detected between meniscoid protrusion lengths across the different spinal levels for the ventral meniscoids (p = 0.70) or for the dorsal meniscoids (p = 0.73). The distribution of the three meniscoid compositions across each of the spinal levels can be seen in Table 1. Median ventral and dorsal meniscoid surface areas for males and females can be seen in Table 2. No significant differences existed between meniscoid surface areas of males and females for ventral (p = 0.52) or dorsal (p = 0.37) meniscoids. Median ventral and dorsal meniscoid protrusion lengths for males and females can be seen in Table 2. No significant difference existed between meniscoid protrusion lengths of males and females for ventral (p = 0.44) or dorsal (p = 0.49) meniscoids. The distribution of adipose, fibrous and fibroadipose meniscoids between the genders can be seen in Table 1. The distribution of ratings of the severity of articular cartilage degeneration across the spinal levels can be seen in Table 3. The distribution of cartilage degeneration appears to be generally consistent across the spinal levels, with Grades II and III being the most common scores for each level, with the exception of C3–4 which featured Grades I and II as the most common scores at that level. The distribution of the four cartilage degeneration ratings between the three meniscoid compositions can be seen in Table 1. All three adipose meniscoids were associated with Grade I or II cartilage, 54% of fibrous meniscoids were associated with Grade I or II cartilage, and 75% of fibroadipose meniscoids were associated with Grade I or II cartilage. Median surface area and protrusion length for both ventral and dorsal meniscoids can be seen arranged by cartilage degeneration score in Table 2. No significant difference existed between the various cartilage ratings with respect to ventral meniscoid surface area (p = 0.99), dorsal meniscoid surface area (p = 0.23), ventral protrusion length (p = 0.62) or dorsal protrusion length (p = 0.45). The findings of this study demonstrate distinct patterns of morphological variation within the meniscoids of the cervical zygapophyseal joints. Meniscoids were composed of adipose tissue, fibrous tissue, or a blend of adipose and fibrous tissues, and this composition appears associated with articular degeneration. Neither meniscoid size as a percentage of joint surface area nor protrusion length into the joint were significantly associated with position of the meniscoid within the joint, gender, spinal level, or articular degeneration. Meniscoids were identified in 48 (86%) of the 56 joints included in the study. This figure is consistent with figures of cervical meniscoid prevalence reported in studies by Inami et al. (77%), Mercer and Bogduk  (100%), and Kos et al. (100%). Friedrich et al. found meniscoids to be common throughout the zygapophyseal joints; however, did not specify the proportion of joints containing meniscoids. These figures are in conflict with prevalences reported by Yu et al. (20%) and Fletcher et al. (0%). This discrepancy may be related to differences in the methodologies employed, as the latter two studies used cryomicrotomy with sagittal sectioning to examine the meniscoids, whereas the studies reporting higher figures of prevalence used gross dissection [9, 11, 13] or magnetic resonance imaging (MRI). Considering the agreement in prevalence reported by the dissection and MRI studies, the possibility that the cryomicrotomy studies underestimated the prevalence of the meniscoids due to inherent differences in this methodology cannot be discounted. The zygapophyseal joint meniscoids examined in the present study were primarily of fibrous (74%) or fibroadipose (22%) composition, with only 4% of identified meniscoids being of adipose classification. This is consistent with results reported by Mercer and Bogduk  in their studies on cadavers. In contrast, Inami et al. reported that 20% of meniscoids identified in their dissection study were of adipose composition, and Friedrich et al. 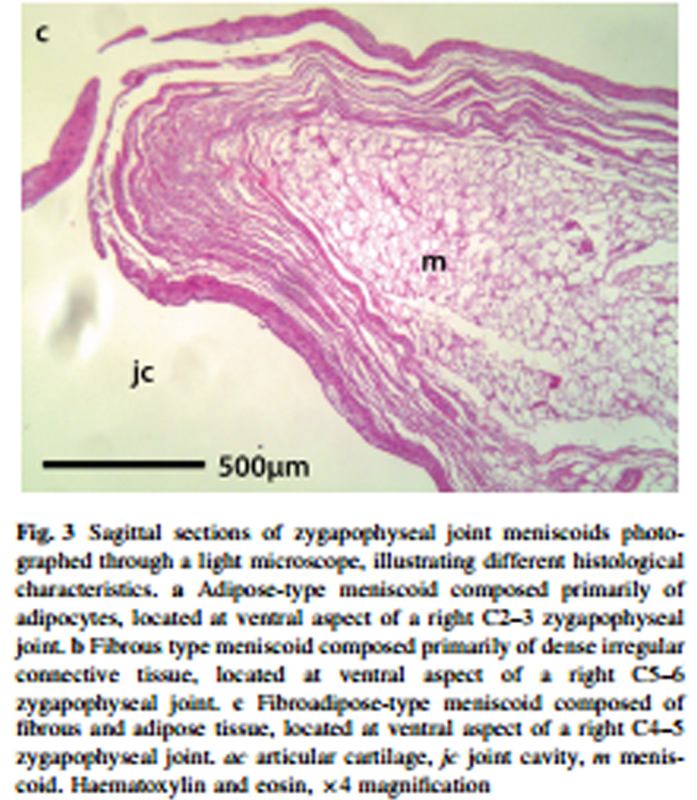 found 62% of zygapophyseal joint meniscoids investigated in their in vivo MRI study to be of adipose composition. The large proportion of adipose meniscoids reported in Friedrich and colleagues’ study may be related to an average sample age that was much younger (mean age 42 years) than the elderly specimens that are typical of dissection studies. This possibly reflects age-related changes in meniscoid composition, as proposed by Bogduk and Engel , suggesting adipose meniscoids may become fibrous in composition in response to long-term mechanical stress or increasing joint degeneration. However, Friedrich et al. deduced meniscoid tissue composition based upon MRI signal intensities, whereas the dissection studies directly viewed tissue types using light microscopy, and as such, error associated with interpretation of tissue based upon MRI signal intensity is also a possible explanation for the discrepancy in findings. Higher levels of articular cartilage degeneration appear to be associated with the presence of fibrous type meniscoids in this sample. Almost half of the fibrous meniscoids were associated with Grade III or IV cartilage degeneration, compared to a quarter of fibroadipose meniscoids and no adipose meniscoids. This pattern was also reported by Inami et al. and by Kos et al. and may plausibly infer a biomechanical or possibly pathological relationship between meniscoid composition and degenerative changes within the cervical zygapophyseal joints. Meniscoids were generally between 2 and 4.5 mm long, with a surface area of approximately 12–30% of the zygapophyseal joint surface area. No significant differences were detected in either parameter of size on the basis of spinal level. Meniscoid surface differed significantly between the classifications of meniscoid composition although the small number of adipose meniscoids compared to fibrous and fibroadipose meniscoids should be considered in the interpretation of this analysis. The position of a meniscoid at the ventral or dorsal pole of a joint did not influence any measured aspect of meniscoid dimensions. The overall distribution of meniscoid type did not appear to be related to their position within the joint. Investigation of the association of gender with meniscoid size or composition has not been reported in previous dissection studies of the zygapophyseal joints. Meniscoid surface area was measured as a proportion of joint surface area to control for normal variation in spine size between larger and smaller specimens, as may be the case between males and females, and allow investigation of meniscoid surface area relative to the enclosing joint. No significant differences were detected between the meniscoids of male and female donors with respect to proportional meniscoid surface area or length. Distribution of the three meniscoid compositions between the genders was essentially similar, with the exception of one female specimen that possessed all three of the adipose-type meniscoids (Table 1). Cervical zygapophyseal joint meniscoids have been suggested as being involved in neck pain [1, 4, 11–13]; however, their precise role in musculoskeletal spinal pain is not well understood. The patterns of variation in meniscoid morphology observed may be relevant to musculoskeletal neck pathology as they could provide insight into biomechanical influences acting upon the zygapophyseal joints and their encapsulated meniscoids , and in turn, the potential pathomechanical processes affecting these structures. For instance, the association of fibrous type meniscoids with increased cartilage degeneration may reflect an adaptive response to long-term biomechanical stress and/or mechanical degeneration of the articular structures, as in the case of osteoarthritis or degenerative cervical myelopathy. Cervical meniscoids have been theorised to be involved in acute pain through their mechanical entrapment between the zygapophyseal joint surfaces leading to hypomobility and pain [11, 17], and through contusion in cervical trauma such as WAD [2, 17]. 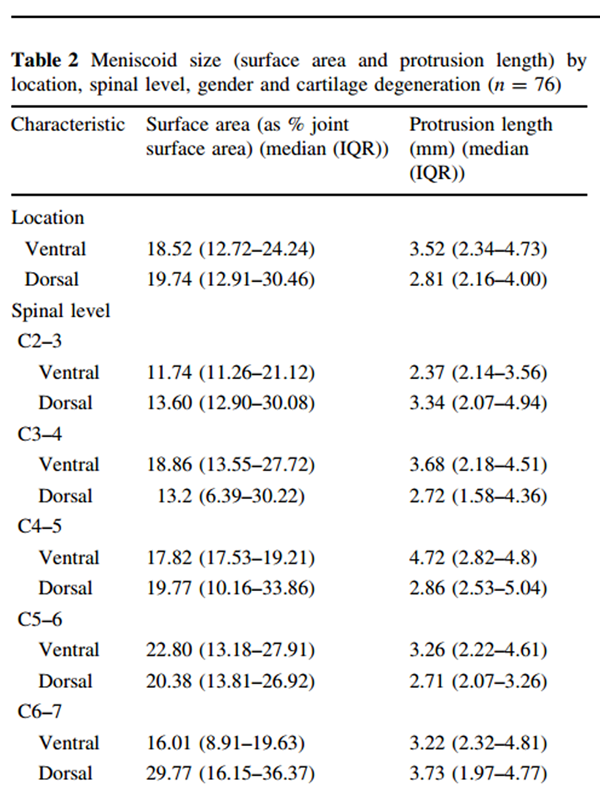 The protrusion lengths noted in this study—QR 2.2–4.32 mm, range 0.49 to 7.05 mm––suggest that larger cervical meniscoids may be of sufficient size to permit their impingement between the articular surfaces, and as such support the plausibility of these two theorised mechanisms of acute pain. The present study and prior investigations of meniscoid anatomy have provided insight into morphological characteristics and patterns of the structures in cadaveric [9, 11, 13] or non-pathological living  populations. However, to understand the role of the cervical meniscoids in a clinical context, further research is required to compare and contrast the morphological properties of meniscoids in pathological and healthy populations. The cadavers included in the study sample were elderly, thereby limiting the capacity to explore the relationship between age and meniscoid morphology or to generalise findings across the lifespan. Medical records accompanying the cadavers specified cause of death but did not detail whether donors suffered any form of neck pathology, therefore it is unclear whether findings were influenced by any pre-existing pathology. Furthermore, time and resource restrictions allowed only one side of each spine to be included in the study. Whilst the sample had an even representation of left and right joints, it was not possible to compare differences between left and right joints within the same spine. The results of this morphological study of the cervical zygapophyseal joint meniscoids in cadavers suggest that meniscoid size is not influenced by gender, spinal level, position in joint, or articular degeneration. Meniscoid size may differ between histological classifications; however, the low quantity of adipose meniscoids makes the strength of this finding questionable. There appears to be a relationship between meniscoid composition and articular cartilage degeneration, as fibrous type meniscoids were more frequently associated with increased degeneration. This pattern may be indicative of biomechanical influences upon meniscoid morphology, and as such, may have implications in the context of musculoskeletal neck pain. Further research is required to examine these morphological properties of the structures in a pathological population. The authors wish to thank Dr. Jonathan Broadbent for sourcing equipment, Assoc. Prof. Phil Sheard for his advice regarding the methodology, and Brynley Crosado and Amanda Fisher for their technical expertise. The authors would like to gratefully acknowledge those who have kindly donated their bodies. This study was funded by The University of Newcastle Research Training Scheme. SF is supported by an Australian Postgraduate Award scholarship. Clinical anatomy of the lumbar spine and sacrum, 4th edn. On cervical zygapophyseal joint pain after whiplash. The menisci of the lumbar zygapophyseal joints. A review of their anatomy and significance. The theoretical pathology of acute locked back: a basis for manipulative therapy. Does formic acid immersion affect the morphometry of cervical zygapophyseal joint meniscoids? Age-related changes in the cervical facet joints: studies with cryomicrotomy, MR and CT.
Reference data for in vivo magnetic resonance imaging properties of meniscoids in the cervical zygapophyseal joints. The micromorphologic and histologic study for the meniscoid of cervical and lumbar zygapophysial joints (Chinese). Immunohistochemical demonstration of nerve fibres in the synovial fold of the human facet joint. Meniscoids of the intervertebral joints. Les menisques intervertebraux et leur role possible dans les blocages vertebraux. The lateral atlantoaxial joints and their synovial folds: an in vitro study of soft tissue injuries and fractures. Cervical spine injuries: an autopsy of 109 blunt injuries. Age-related changes in the lumbar facet joints. Synovial folds—a pain in the neck? Morphometry of the synovial folds of the lateral atlanto-axial joints: the anatomical basis for understanding their potential role in neck pain. Facet joint menisci of the cervical spine: correlative MR imaging and cryomicrotomy study.